A native of California, cellist Maggie Hummel began her cello studies with Nancy Yamagata of the Colburn School and later John Walz of the Los Angeles Opera. Ms. Hummel would continue her education at Northwestern University, earning a BM in Cello Performance under Hans Jorgen Jensen. Following her undergraduate work, Ms. Hummel was accepted into the Civic Orchestra of Chicago. In 2010 Ms. Hummel returned to her studies, earning a Master’s degree in Cello Performance from the Peabody Institute under Alan Stepansky. 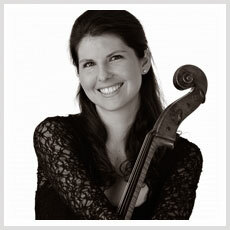 While at Peabody, Ms. Hummel also studied baroque cello and performance practice with cellist John Moran. While in the DC area, Ms. Hummel has maintained a full teaching studio, both privately and through the Capitol Hill Arts Workshop, where she has utilized Suzuki philosophies to teach young children both individually and in group settings. Additionally Ms. Hummel has served as a cello coach for orchestras at Longfellow Middle School, Langley High School, and Kipp’s Connect Academy. Ms. Hummel has also performed extensively in the DC area as a member of many groups including Sage Strings and the Inscape Chamber Orchestra. Having just concluded a contract as a section cellist with the National Symphony Orchestra, Ms. Hummel is now excited to call St. Louis home, as she embarks on a new journey with her husband, Jeffrey Strong, the newly appointed 2nd Trumpet in the St. Louis Symphony. Along with their shared love of music, Ms. Hummel and and Jeffrey enjoy running their dog Archer and chasing their cat Fisher.